Last week was a good week. It all started with a Monday morning run and I knew it was going to be a good week. The week started with LIFE, just regular old life, but we lived it. Between running the kids around, cleaning the house, work, and errands, our family made time to eat dinner together, play outside, and read books before bed. It was just life, but it was awfully satisfying. On Thursday and Friday I traveled to Philadelphia for work. In Philly I did what I do best – new business development conversations to help drive business for our company and ongoing client relations with an existing client. 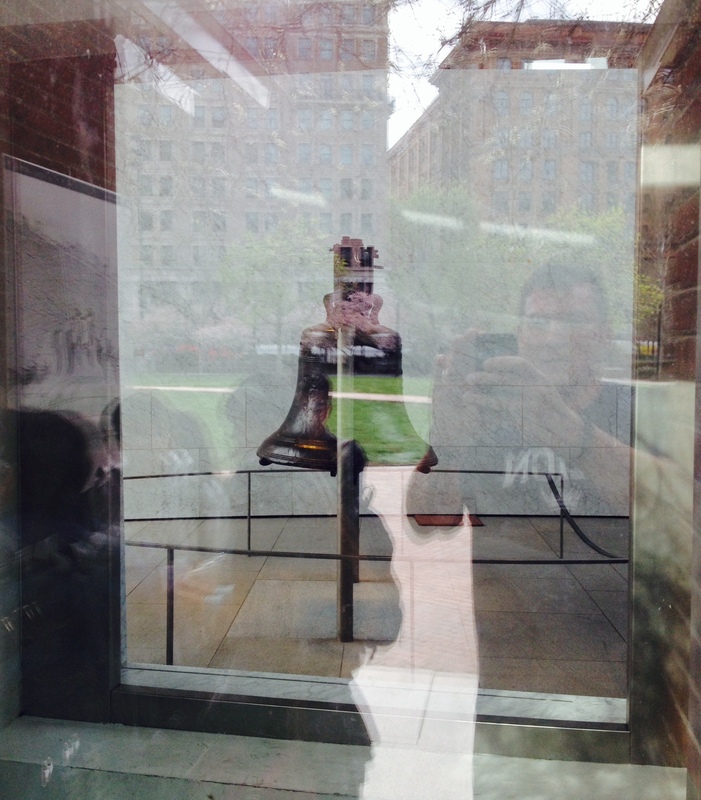 Around work, I squeezed in a morning run in the historic district of the city, and stopped to snap the above picture of the LIBERTY BELL. It was pretty cool to run on cobblestone streets where Benjamin Franklin, Thomas Jefferson, and Paul Revere once walked to the pub. The weekend held the PURSUIT OF HAPPINESS. 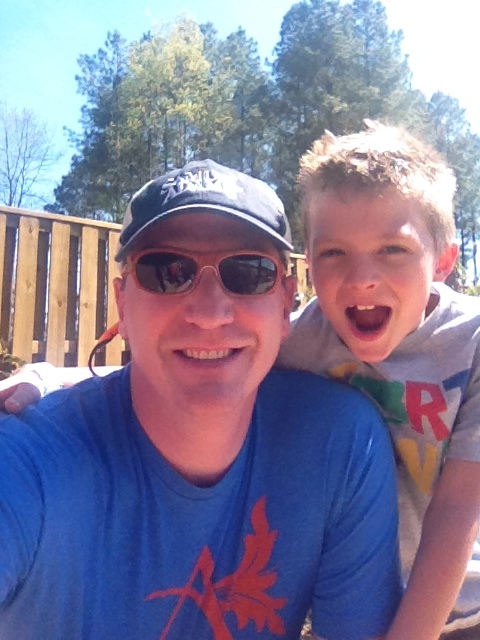 Eight years ago I left the college basketball coaching world out of frustration with the ‘business’ the game had become and in search of more stability for my family. I still get frustrated with the business of the game, but in the last eight years I have realized that coaching the game of basketball is still a passion of mine. Over the weekend, I coached a boy’s high school AAU team in a tournament and was able to feed that passion. We won some and lost some, and we were able to teach lessons in both that made them better players, a better team, and hopefully better men. That all would have made for a good week, but what really made it great was the ending…when I arrived home Sunday afternoon, my wife and kids greeted me with hugs and kisses and we set out on a family bike ride. We enjoyed the warmth and the breeze on our leisurely ride and on the way home made a rare all family grocery stop for dinner supplies. I grilled burgers and we sat on the back porch and ate together to end a pretty great day. I thank God that I am able to recognize and realize the blessing HE provides in so many ways – in life, in work, in family, in fun, and in hobbies. I truly believe that we all have the opportunity to be thankful in each small area of our life if we choose to make the moment we are in a meaningful moment. Today started with a Monday morning run too, so here’s to another great week. Fear: An emotion caused by the belief that someone or something is dangerous. Courage: The ability to act in the face of fear. 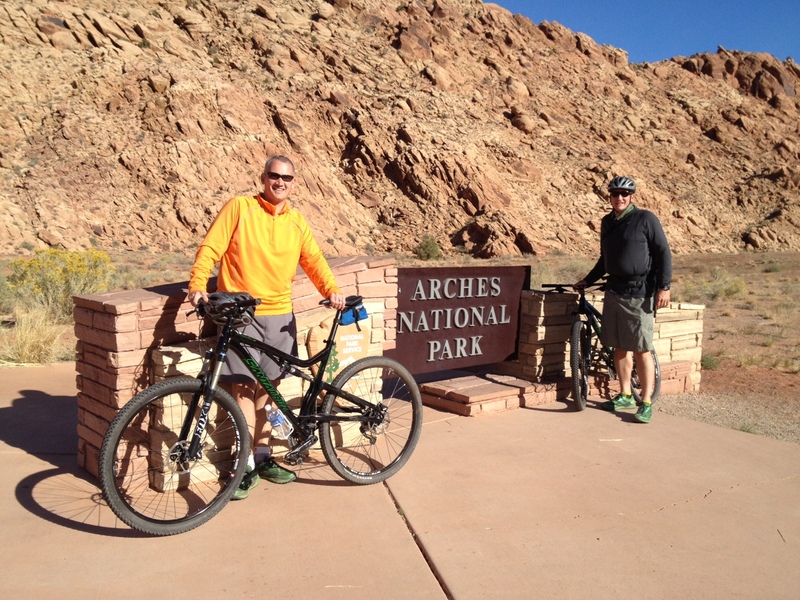 A little over a year ago, my friend Brad and I decided to go mountain bike riding in Moab, Utah. For those of you unfamiliar with mountain bike culture, Moab is to mountain biking what Nashville is to country music. Neither Brad nor I are exactly mountain biking experts and when you put two 6 foot, 3 inch guys over the handlebars of a piece of aluminum screaming down a rocky trail we’ve never been on, fear will creep in to the picture. The photo above was taken AFTER we faced those fears and came out on the other side at the entrance of Arches National Park, unscathed and courageous. I tell this story to illustrate a lesson that I’ve been visiting quite a bit lately – fear is not something to ignore, it is something to embrace. It has been amazing to me that as I have improved my level of self-awareness, I have become acutely aware of how much fear I have in my life…fear of failure when I go into a big business pitch, fear of a lack of approval from my boss for my job performance, fear that I am making parenting mistakes, fear that I’m not meeting all of my wife’s emotional needs, fear of being accepted by new friends for being who I am, fear of disappointing my true, long time friends because I’m not available enough for them, and the list goes on and on. For a while I was so ashamed of these fears thinking I was weak and lacked self confidence. The turning point for me was a realization that the fact that I can recognize these fears creeping in to my thoughts, gives me an amazing power. I now can recognize the fears for what they are – simple emotions, not good or bad, just feelings. I have now become the most courageous person I know because I recognize the fear is there and I ACT. I do not allow the thoughts of fear to linger for more than a moment, I attack them with a rigor that allows me to confidently sit across from a client and stay completely in the moment with them, I work every day in a way that I know will produce my best, I parent with love and grace and trust that it is enough, I do things that I know will make my wife feel good when I see them to be done, I talk to new friends in honesty and straightforwardness and let them decide where the relationship goes, and I try to touch my dearest friends in multiple ways through the power of technology on a regular basis. My life isn’t always screaming down the side of a single track mountain bike trail, but my fears are real. I’m courageous because just like during that trail ride, I hold on tight, pay close attention, and only go as fast as is prudent. The “Red Eye” flight is brutal. For the unaware, a red eye flight is one that leaves the West Coast late at night and arrives the next morning on the East Coast (for example, last night I left Portland, OR at 10:15p and arrived in Charlotte, NC at 6:05a). It isn’t any fun, not one is happy to be on it, it is not easy to sleep in a plane for anyone (let alone a 6’4″ man), and you end up at your destination bleary-eyed and groggy. So why do I red eye? I red eye because of the picture above. By taking the red eye last night, I walked through my front door in time to walk my son to the bus stop and see him off to school. We had a conversation about a news story he saw about the forest fire ash in Arizona leading to glacial melt in the Arctic, and I kissed my wife and daughter before they went to work and day care. I took a short nap and got back to the day’s work. It was TOTALLY worth it! This is the second time in my life I’ve traveled a lot for work and I feel like I’m doing it better this time. When I make travel arrangements, I try to always take into consideration what is going to put the least stress on the family and still allow me to meet my business obligations. I try not to have too many back to back weeks of travel. And when I am home, I do everything I can to be present, available, and flexible with my schedule so that I can give more of my time to my family. On the road, I try to get good rest, get in a morning run, and not eat junk every single meal. It still isn’t perfect. Business travel is a tough part of life for a lot of people today. I have learned a lot in my life through travel and most recently, I’ve started to learn to treat business travel like any other commute and do the best to get where I’m going safely and on time for the important things in life like walking to the bus stop.